Branko Dimitrijevic was born in 1956 in Arandjelovac, Serbia. He graduated with the degree in architecture, and then studied graphics in Zagreb, Croatia. He has been painting since 1976, has had exhibitions in Germany, Italy and all over the former Yugoslavia. Today he lives and works in Arandjelovac..
As a painter of landscapes, Dimitrijevic is not exclusive to one theme, he also frequently paints urban motifs – the city rush, facades and old buildings, but also the theme of man’s eternal love for the sea – the sun, boats, stone houses, shores and harbours in the afternoon sun. The part of the day when everything on the sea is still and quiet, when there’s not a breath of wind or any movement, and the only thing in the air is the relief after the midday heat, that is the moment the painter often chooses as a motif for his work. A seaside town on the horizon, partly lit by the setting sun, old fishing boats and luggers waiting for the next night of fishing. The scenes of eternal and timeless beauty of nature. The urban themes are no less strong in expression. When Dimitrijevic paints the city, it’s the frenzy and greyness of the streets, people and cars in constant movement, and also the images of old buildings, dusty facades and windows, with the inevitable laundry hung to dry. Unlike most modern painters, Dimitrijevic often and gladly paints the human figure in the city landscape, a detail that provides realism to the urban image. Dimitrijevic is a painter of expressive voice, a steady hand that easily makes wide strokes, whether it’s with a brush or with a trowel. 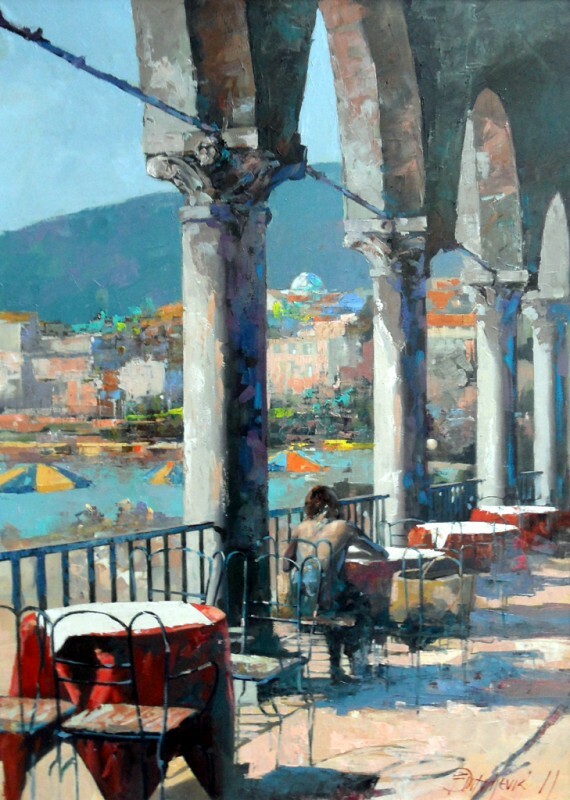 When he paints the sea, the colours are warm, Mediterranean, full of light and shadow, while in cityscapes greyish-blue tones dominate, so his themes differ both in dynamics and in colour scale. In his paintings, the various themes offer something both to the dreamers and to realistic souls, the artist lets us choose that which we enjoy the most.